TIFF 2014: What’s hot and what’s definitely not! 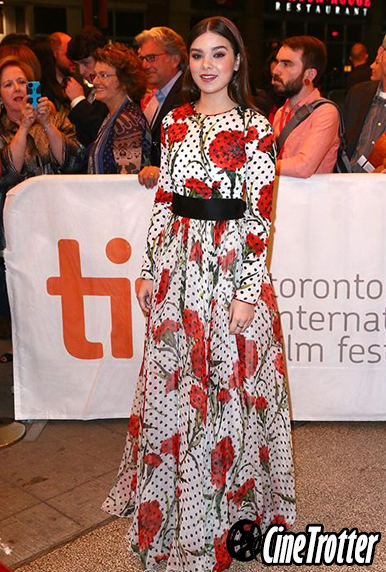 It might not be as glamorous as the Academy Awards or Cannes Film Festival, but TIFF has its own fashion moments. Reese Witherspoon is absolutely flawless in her Saint-Laurent little black dress. She is stunning in her purple wool-blend brocade dress from Dolce and Gabbana. Among all her amazing looks this year, I have to say that nothing looks more perfect than this white Chanel on Keira! Jessica Chastain is gorgeous in her black-and-white Christian Dior cocktail dress. Jessica Chastain in a Christian Dior black-and-white cocktail dress. British actress Kate Beckinsale in an Azzaro jumpsuit that suits her perfectly! Felicity Jones is absolutely perfect in her Armani Privé frock! Anna Kendrick is cute in shell pink. Amanda Seyfried is perfection in Valentino. Julian Moore is dazzling in white Chanel. Jennifer Aniston stuns in her little black dress. Jane Fonda wows us in Elie Saab. And in her Haney black pantsuit. Indian Bollywood star Priyanka Chopra is amazing in her Alice + Olivia BW dress. Sophie Desmarais is absolutely gorgeous in her BW outfit. Chinese actress Zhou Dongyu is fabulous in a SS2014 Georges Hobeika half-sleeve crop top embroidered with Swarovski crystals and flower-shaped sequins over a yellow organza and tulle skirt. Kristen Bell shocks in this Etro jumpsuit. What was she thinking when she chose it! Aubrey Plaza disappoints despite the hot pink of her Marni dress. Miss Peregrym is another huge fail in white. No and no and no to Noami Watts in Antonio Berardi. The waist design is pure ugliness. Cara Delevingne’s green mermaid dress is a total failure. Hailey Steinfield in her D&G floral dress… not quite sure what she was thinking of! Not sure what’s going wrong… but in the end it is a definite No for Elizabeth Banks in Chloe. After 2 dazzling looks, Reese Witherspoon disappoints us with this dotted dress which is a complete failure. What’s your opinion? Share with us your comments below!